Notching is another old motif. It can be used wherever two cut surfaces meet at an angle. When notching is emphatically cut — and especially where it incorporates cuts of different sizes — notching becomes beading which can be classified into two main types: simple and compound. The former uses beads of one size, the latter beads of at least two different sizes (e.g., long-short). Sometimes it is worthwhile paying attention to this aspect of beading because it may help to identify a particular piece of cut glass. But, unfortunately, this is not always the case; manufacturers gave little thought to future collectors of their wares and were not always consistent in their use of beading! LEFT: Notched flutes on the neck of a “wine bottle” cut in the Arcola pattern by C. Dorflinger & Sons. In addition to the notching, there are three sets of triple prismatic rings, vestige of a design sometimes found on late eighteenth and early nineteenth century decanters cut in the Anglo-Irish tradition. 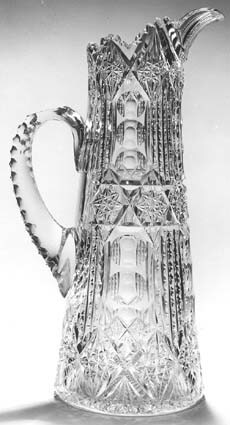 RIGHT: Notched flutes on present-day cut glass: A William Yeoward Crystal (England) interpretation of a nineteenth century cut-glass carafe. Note the retention of a triple prismatic ring. 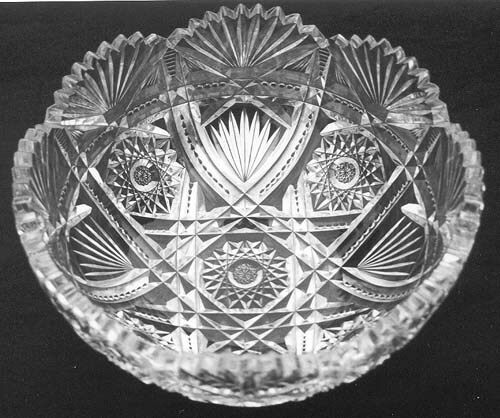 A typical use of simple beading: Salad bowl cut by L. Straus & Sons in the company’s Majestic pattern of 1894 (patent no. 23,727) on shape no. 426. Mechanically polished. D = 8″ (20.3 cm), H = 3.4″ 8.6 cm), wt = 3 lb (1.4 kg). Sold for $406 at an eBay auction in 1999. 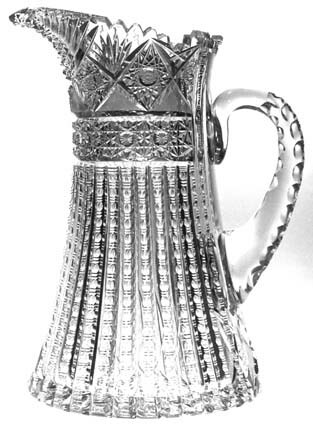 Three examples of complex beading: LEFT: Pitcher with triple-notched handle. Three horizontal chains of Brunswick stars are separated by bullseyes and beading (long-short-long) arranged vertically. 32-pt hobstar base. Manufacturer/pattern unknown. H = 14.25″ (36.1 cm), base D = 5.5″ (14.0 cm), wt = 6 lb (2.7 kg). Sold for $375 in 1984. RIGHT: Pitcher with two columns of bullseyes and a median of double-Xs on its handle. Prominent beading (long-short-short-long) below a horizontal band of Russian Canterbury. Chain of hobstars, strawberry (fine) diamonds, and fans above the band. Step-cutting below the pitcher’s spout. 24-pt hobstar on base. Pattern possibly matches that on a footed bowl cut by Everett Stage, c 1910 as shown in Sinclaire and Spillman (1997, illus. 708). H = 10.5″ (26.7 cm), base D = 6.25″ (21.0 cm), wt = 6.5 lb (3.0 kg). Sold for $475 in 1983. 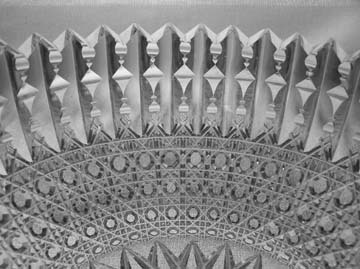 BELOW: Complex beading as used in Libbey’s Prism pattern where it is partnered with the standard cane motif. 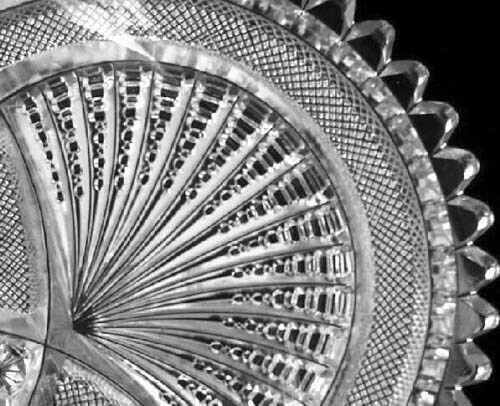 The addition of a fan at the end of beading, either simple or complex, results in the somewhat inconsistently named notched prism flair motif shown at the right. 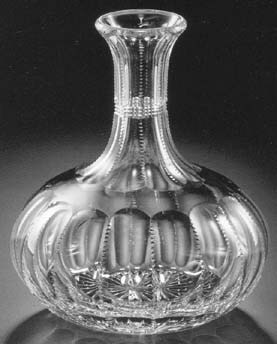 Two additional examples of cut glass that feature prominent beading can be seen at the following areas: the Boston pattern by Mt. Washington/Pairpoint and the Santa Maria pattern by L. Straus & Sons.